Top photo: Attorney Robert J. Bingle; Bottom photo: Attorneys Michael Flanagan, Susan J. Schwartz, Robert J. Bingle and Daniel S. Kirschner. 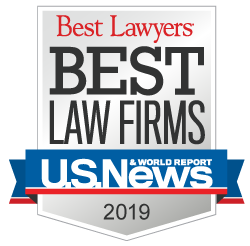 For more than 20 years, Corboy & Demetrio Managing Partner Robert J. Bingle has led our firm’s Misericordia Candy Days team. 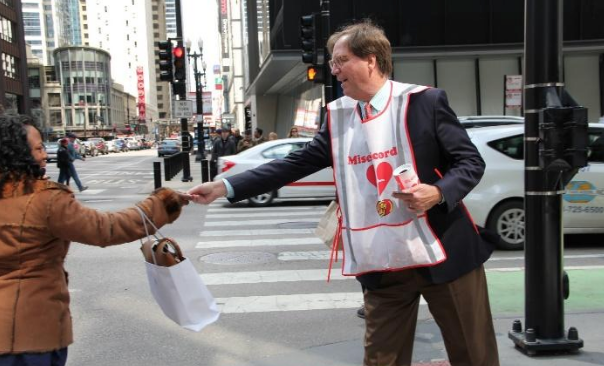 As he does each year, Bob stood at the corner of Dearborn and Washington on April 27, 2018, collecting money and passing out jelly beans to those who donated. 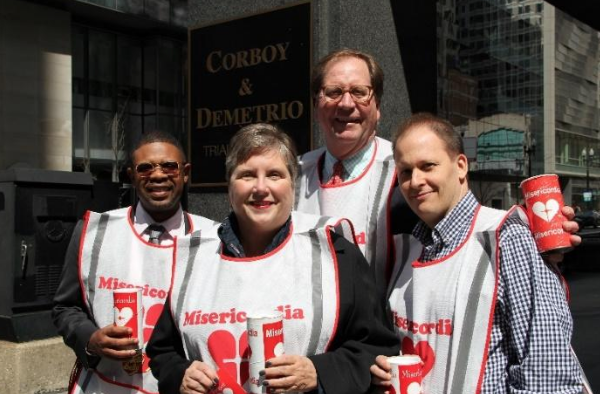 More than 25 Corboy & Demetrio employees, including our lawyers, legal assistants and other staff, took turns standing outside our office at 33 N. Dearborn Street across from Daley Plaza to help Misericordia, Heart of Mercy, which houses and provides services to children and adults with developmental disabilities.